Back to School Recipes for Working Moms - Fall Favorites! With many families already in back-to-school mode — which means a return to a regular routine, more time spent prepping for school and after-school activities, and cravings for fall flavors and comfort foods — we’ve rounded up several back-to-school recipes for working moms. Most of them take less than 60 minutes, and the leftovers will make good lunches you can take to work throughout the week. What are your tried-and-true back-to-school recipes? What have you recently discovered that you’ve been wanting to try as the season changes from summer to fall? Psst: We’ve also talked about favorite fall recipes, super-slow and super-fast recipes for long work days, slow cooker recipes for working women, and the best cookware and kitchen appliances — and Kat’s shared some of her easy weeknight dinners. 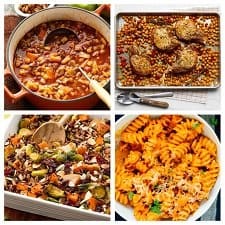 Pictured at top, clockwise: Harvest Chipotle Chili: Midwest Living / Rosemary-Garlic Pork Chops with Chickpeas: Food Network / Pumpkin Marinara Pasta: Cookie and Kate / Healthy Chicken Casserole: Delish. 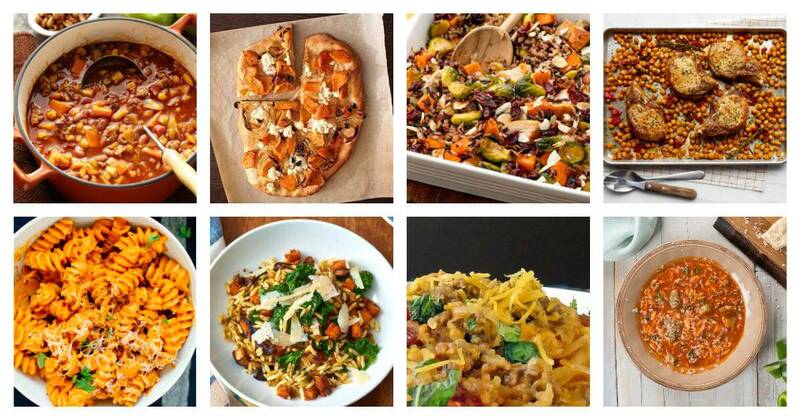 Last fall, a reader shared a recipe from The Kitchn for orzo with caramelized fall vegetables and ginger (above, left). Prep time: 20 minutes; total time: 50 minutes. Another reader suggested one of Rachael Ray’s 30-minute meals, stuffed pepper soup (above, right). Delish offers a recipe for a healthy take on chicken casserole that includes Brussels sprouts, sweet potatoes, cranberries, and almonds. Prep: 20 minutes; total time: 60 minutes. Food Network suggests rosemary garlic pork chops with roasted chickpeas — all in one pan. Active time: 20 minutes; total time: 35 minutes. All Recipes offers several ideas for squash, including baked spaghetti squash with beef and veggies for when you have a little more time. Prep: 25 minutes; total time: 85 minutes. Cookie and Kate has a vegetarian creamy pumpkin marinara sauce — just add pasta. Prep: 10 minutes; total time: 25 minutes. Real Simple provides a recipe for pizza with roasted butternut squash and onion, topped with ricotta. Prep: 25 minutes; total time: 70 minutes. Midwest Living offers a spicy-sweet take on chili that features apples, sweet potatoes, and peppers. Prep: 30 minutes; total time: about 60 minutes. What recipes are you planning to make for back-to-school? What makes for a good back-to-school or fall recipe? Are you more or less likely to try something new this time of year — or is it easier to stick with the recipes you already know your family will love — especially if you have picky eaters? Let us know! 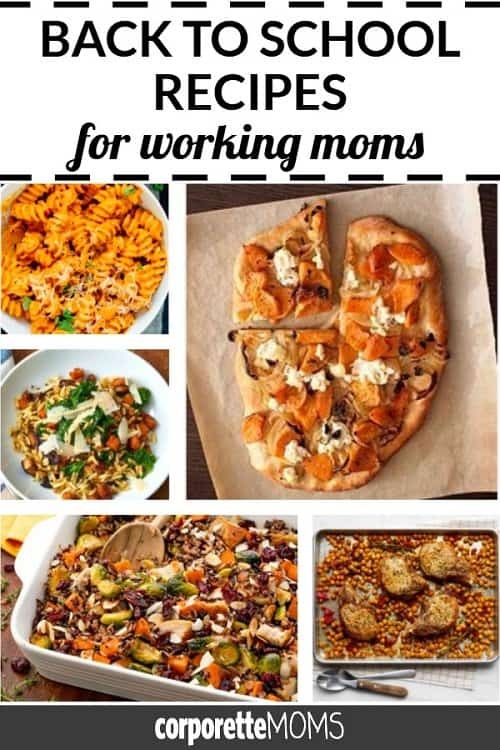 I’d love to hear ideas for when a spouse is working late and you are trying to wrangle little ones while getting a semi-healthy meal on the table. Quesadillas and grilled cheese get old after awhile! I suggest getting things in your freezer. Like making a huge batch of soup or chili on the weekend and freezing it and you can simply reheat it for easy dinner. Another fast favorite: Sweet potato tater tots, salsa, guac, frozen meat from the freezer (Melissa Clark’s instantpot garlicky cuban pork is a favorite), lettuce, cheese if thats your thing. This is what the “nibbles plate” is for. Artfully arrange all the little scraps of leftovers on your child’s plate. Bonus points for cut-up veggies, cheese/crackers/cold cuts, some fruit with yogurt as a dip. It’s absolutely my kid’s favorite dinner for a busy night. If that fails, we do eggs and toast and fruit. in this situation, if we’ve had too many nights of mac and cheese or eggs (which we do plenty), i usually bake two chicken legs. i prepare in about one minute by adding a bit of rosemary, oil and lemon and stick into the oven, and we have enough left for lunches. i do think my almost 4yo notices and appreciates that i do sometimes cook for her and not just when dad is there. I try to keep a craft for my 4-year-old set up and ready in the cupboard to buy time for nights like this. Play doh also buys me 10-15 minutes. Quick ideas: Cheese Omelet with sliced veggies on the side; add thinly sliced apple to the grilled cheese for something different; make the quesadillas “pizza” quesadillas instead of Mexican.